Select a shape in the SmartArt graphic. In the Text pane, click [Text] in the pane, and then type your text (or select a bullet and type your text). Click a circle in the SmartArt graphic, and then type your text. Note: If you do not see the Text pane, you can open it by clicking the control on the left side of the SmartArt graphic. You cannot add text to the overlapping portions of a Venn diagram from the Text pane. Instead, you can insert text boxes and position them over the overlapping areas. In Excel click Text Box. In Outlook, click Text Box, and then click Draw Text Box. In Word, click Text Box, and then at the bottom of the gallery, click Draw Text Box. Click and drag in an overlapping circle. Draw the text box the size you want. To add text, click inside the box and type. To change the background color from white to the color of the overlapping circle, right-click the text box, and then select Format Shape. To delete the lines around the text box, with the text box still selected, click Line in the Format Shape pane, and then select No line. To position the text box, click it, and then when the pointer becomes crossed arrows ( ), drag the text box to where you want it. If you don't see the SmartArt Tools or Design tabs, make sure that you've selected the SmartArt graphic. You may need to double-click the SmartArt graphic in order to open the Design tab. When you want to add a circle to your Venn diagram, experiment with adding the shape before or after the selected circle to get the placement you want for the new circle. To add a circle from the Text pane, click an existing circle, move your pointer before or after the text where you want to add the circle, and then press Enter. To delete a circle from your Venn diagram, click the circle you want to delete, and then press Delete. To move a circle, click the circle, and then drag it to its new location. Click a layout option in the Layouts group on the Design tab under SmartArt Tools. When you point to a layout option, your SmartArt graphic changes to show you a preview of how it would look with that layout. Choose the layout that you want. To show overlapping relationships in a sequence, click Linear Venn. 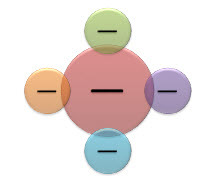 To show overlapping relationships with an emphasis on growth or gradation, click Stacked Venn. To show overlapping relationships and the relationship to a central idea, click Radial Venn. To quickly add a designer-quality look and polish to your SmartArt graphic, you can change the colors of your Venn diagram. You can also add effects, such as glows, soft edges, or 3-D effects. Click the SmartArt graphic whose color that you want to change. Tip: When you position your pointer over a thumbnail, you can see how the colors affect your SmartArt graphic. To change the color of the circle’s border, click Color , and then click the color that you want. To change the line style of the circle’s border, select the line styles that you want, such as Transparency, Width, or Dash Type. Click the SmartArt graphic that you want to change. Right-click the border of a circle, and then click Format Shape. In the Format Shape pane, under Fill, click Solid fill. To change the background to a color that is not in the theme colors, click More Colors, and then either click the color that you want on the Standard tab or mix your own color on the Custom tab. Custom colors and colors on the Standard tab are not updated if you later change the document theme. To increase the transparency of the shapes in the diagram, move the Transparency slider or enter a number in the box next to the slider. You can vary the percentage of transparency from 0% (fully opaque, the default setting) to 100% (fully transparent). Note: You can change the color of a shape, shape border, or entire SmartArt graphic. A SmartArt Style is a combination of various effects, such as line style, bevel, or 3-D rotation that you can apply to the circles in your SmartArt graphic to create a unique look. Note: When you position your pointer over a thumbnail, you can see how the SmartArt Style affects your SmartArt graphic. Tip: If you're using PowerPoint 2013 or PowerPoint 2016, you can animate your Venn diagram to emphasize each circle. For more information, see Animate a SmartArt graphic. Under SmartArt Tools, on the Design tab, in the Create Graphic group, click Text Pane. If you do not see SmartArt Tools or the Design tab, make sure that you have selected a SmartArt graphic. You may need to double-click the SmartArt graphic to open the Design tab. In the Text pane, under Type your text here, select a bullet and type your text. Note: You can also open the Text pane by clicking the control. Right-click the Venn diagram that you want to change, and then click Change Layout. To change the color of the circle’s border, click Line Color in the left pane, in the Line Color pane, click Color , and then click the color that you want. To change the line style of the circle’s border, click Line Style in the left pane, in the Line Style pane, and then select the line styles that you want. In the Format Shape dialog box, in the left pane click Fill, and then in the Fill pane click Solid fill. When you position your pointer over a thumbnail, you can see how the SmartArt Style affects your SmartArt graphic. 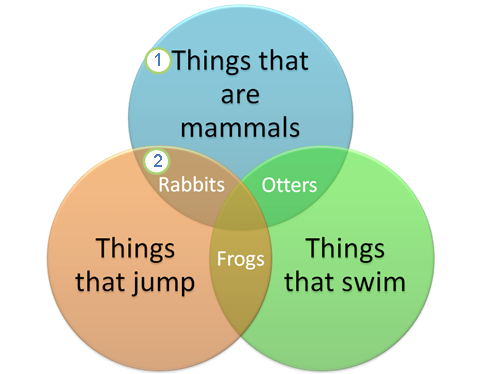 If you're using PowerPoint 2010, you can animate your Venn diagram to emphasize each circle. For more information about how to animate a SmartArt graphic, see Animate your SmartArt graphic. Click the Venn diagram that you want to animate. On the Animations tab, in the Animation group, click the More button , and then click the animation that you want. To make each circle in the Venn diagram enter in sequence, on the Animations tab, in the Animation group, click Effect Options, and then click One by One. Note: If you copy a Venn diagram that has an animation applied to it to another slide, the animation is also copied. When you need to add a circle to your Venn diagram, experiment with adding the shape before or after the selected circle to get the placement you want for the new circle. It's simple to fix common SmartArt mistakes. To add a circle from the Text pane, click an existing circle, move your cursor before or after the text where you want to add the circle, and then press ENTER. To quickly add a designer-quality look and polish to your SmartArt graphic, you can change the colors or apply a SmartArt Style to your Venn diagram. You can also add effects, such as glows, soft edges, or 3-D effects. Using PowerPoint 2007 presentations, you can animate your Venn diagram. To change the color of the circle's border, click Line Color, click Color , and then click the color that you want. To change the style of the circle's border, click Line Style, and then choose the line styles you want. If you're using Microsoft Office PowerPoint 2007, you can animate your Venn diagram to emphasize each circle.